Faculty of Engineering, Shanghai Second Polytechnic University, Shanghai, 201209, P.R. China. Considering backlash, time-varying mesh stiffness and radial clearance of bearing, nonlinear dynamic model of gear bearing flexible shaft system is established taking into account breathing crack in shaft and tooth wear. Nonlinear dynamic equations are solved by Runge-Kutta method. Effect of backlash, crack in shaft and tooth wear faults on the nonlinear dynamic behavior of gear-shaft-bearing system is studied. 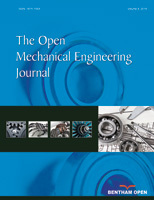 The results show that gear-shaft-bearing system may change from periodic motion to non-periodic motion as backlash increases, and gear pair change from normal mesh to tooth separation, double-sided impact fault. If crack fault appears, quasi-periodic and chaos motion region increases, and gentle crack fault can result in instantaneous tooth separation and double-sided impact faults. Serious tooth wear fault will also induce tooth separation and double-sided impact faults. If both shaft crack and tooth wear faults exist, tooth wear fault will be intensified by double-sided impact fault from shaft crack, which will result in early failure of the gear system.